What are the medical causes of a smelly dog? Ear infections can be due to yeast or bacteria, and often may be due to the breed confirmation of the ear (e.g., long floppy ears like Cocker Spaniels), or due to underlying food allergies or atopy (e.g., hay fever). If your dog has chronic ear infections, check with your veterinarian for an underlying cause. If you’re not brushing your dog’s teeth at least once a week, please do. That’s because tartar can harden into rock hard plaque, resulting in inflammation to the gums and secondary infection. This can cause severe halitosis (i.e., bad breath), among other serious issues. As previously mentioned, certain types of allergies (like food allergies or inhaled allergies) can result in itching, excessive grooming, and secondary skin infections which can cause a foul, yeasty smell of your dog’s skin. Underlying metabolic problems like kidney failure or rarely, liver failure, can result in ulcers developing in the mouth. This can cause drooling, not eating, and severe halitosis. Also, certain endocrine diseases like diabetes mellitus can result in complications when untreated leading to fat breakdown (diabetes ketoacidosis) and an unusual sweet “acetone” smell to your pet’s breath. Certain poisons such as corrosive or caustic substances, or biting into an electrical cord - can cause severe burns or ulcers of the mouth. This can also cause drooling, not eating and severe halitosis. Cancer anywhere in the body can become infected and ulcerated, resulting in a necrotic smell. This can occur in the mouth, in the ears, in the skin or anywhere. When in doubt, if you notice any lumps or bumps, seek immediate veterinary attention! Certain breeds such as miniature Schnauzers are more predisposed to excessively oily skin, resulting in a unique smell and greasy feel when touched. This can be treated with certain shampoos and topical medications. When in doubt, if you notice that your dog is starting to smell, start with a bath. But if it’s persistent, talk to your veterinarian about this unusual – potentially medical – stink! Spring is a bustling time or veterinarians. In small animal medicine, kittens start arriving. Dogs, too, even though they don’t have a seasonal aspect to their reproductive cycles. Spring is a popular time for people to want to add a puppy to the family. With the weather warming up, preventive medicine gets a boost in the spring, too. Pet owners begin thinking more about heartworms, fleas, ticks, and parasites— which, of course, are often year-round risks. What is my veterinarian trying to assess during an appointment? First things first of a wellness visit is a health evaluation. This typically includes a thorough history including your pet’s breed, age, lifestyle, behavior, and diet, then a comprehensive physical exam, including a measuring of thins such as weight, temperature, pulse, and respiration rates. All of the information gathered will be used to further assess whether your pet may be ill. Your veterinarian will determine the appropriate approach for your pet in each of these categories based on the information gathered in the initial wellness exam, and go over their recommendations with you. This is also a good time to bring up any questions or concerns you have. How often should I take my pet to the vet? Adult pets should see their veterinarian at least annually to go over preventive care needs. Puppies and kittens require more frequent visits, usually every few weeks until they are several months old. If your pet hasn’t seen their veterinarian in awhile, consider spring to be your launch into taking the step of scheduling an appointment with your veterinarian today. Attempting to keep wild animals as pets is never a good idea. Safe neither for aspirant owners nor the animals themselves, some endanger human lives while others simply fail to thrive outside the wild. Lemurs, capuchins, chimpanzees, and baboons all fall into the primate category. They are cute and “childlike” but are not a substitute for human babies. Sure, they are often treated like babies by their owners putting them in diapers and strollers but they also act like babies, permanently, with all the messes and screaming included. The biggest issue with pet monkeys is that they are prone to rampages without warning and, possessing sometimes shocking levels of strength while lacking what we comprehend as 'moral conscience' or reason, chances of effectively controlling such behaviors are slim. They may also bite their owners which is something the health department doesn't like. This is especially scary given the fact that they can transmit diseases like Hepatitis A and HIV-1, the virus that causes AIDS. Cougars, lions, tigers, and leopards make up the majority of large cats kept as pets. They are strong and dangerous, to say the least. If you think you can just de-claw a lion like you did your little house cat then think again. De-clawing removes the entire last bone in each toe. If you remove the tips of the toes of a large cat, they are unable to properly walk because of their size and become paralyzed when the procedure is done incorrectly. Large cats like tigers kill their prey by biting their throats, not by clawing them to death, so they are still dangerous even without claws. If the teeth don’t kill you, their crushing jaw pressure will. Removing dangerous body parts does not create a good pet. Venomous snakes could kill you with a single bite and there is most likely no anti-venom close enough to help you. Some cobras can also cause immense pain and blindness just by spitting their venom into your eyes. There are plenty of pet snakes available that do not produce venom so it is easy to stick with the safer species. Extreme safety measures must be taken if these snakes are kept in a home, and if they do escape, you are endangering the lives of not only your family but your neighbors, too. Despite the fact that bears can weigh over 1500 pounds full grown, people still feel they are like cute and cuddly teddy bears. Bear cubs are appealing for many reasons but they don’t stay small for long. They will tower over you when they stand on their hind legs and can knock you over, or even kill you, with a swift blow of their paw. 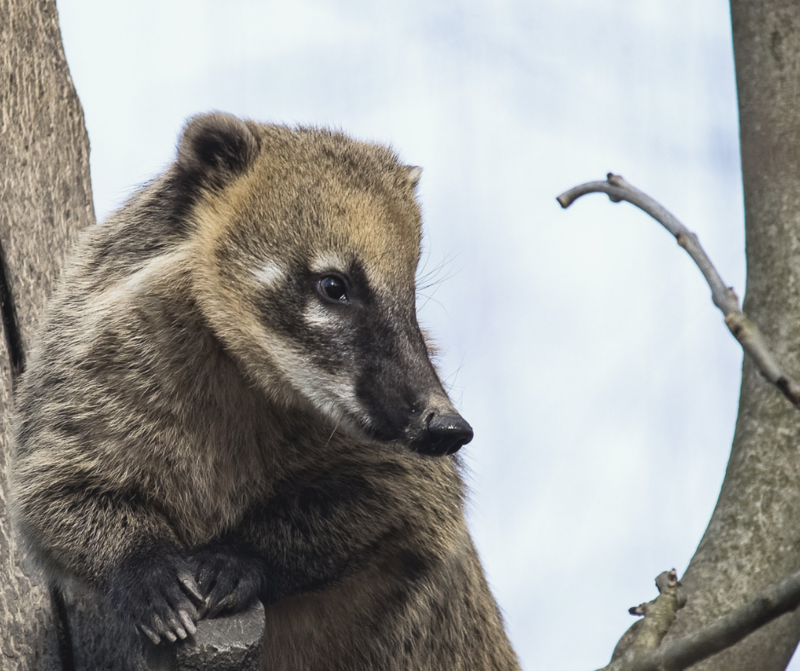 The coati (pronounced ko-wot-ee and sometimes referred to as a coatimundi) is a member of the raccoon family. Originally from South America, these omnivores require a large enclosure to roam about. They are extremely active and difficult to train. They have 38 to 40 sharp teeth, forage for their food, and require a lot of mental stimulation, much like a pet monkey. Needless to say, even though they are kept as pets more and more, they are still wild animals that can deliver a pretty nasty bite. What carries Rabies and SARS, has sharp teeth, sleeps all day, and flies all night? Bats. The truth is, bats are extremely cute and intriguing, but a hands-off approach is best since there is the possibility of zoonotic disease and no realistic way to care for a bat in your home. They can live over 30 years, hibernate for months in colder climates, and eat insects, fruit or blood at night (depending on the species). These little guys are better left outside so don't bring one of these cute critters into your home intentionally. Wolf and coyote ancestors were too wild to live alongside humans which is why domesticated dogs exist. Wolves and coyotes are still wild today and they act on their instincts. They hunt when they are hungry, play when they want to, and sleep the rest of the day. If they feel threatened, they will attack. They can kill a full-grown moose and sense the sickest animal in a herd, even when that animal shows no symptoms. Like large cats and bears, they are far from domesticated and cannot be trusted. Wolfdogs have also grown in popularity as pets but are not much different from their pure wolf cousins, therefore, they too should be avoided. The American alligator can reach over 14 feet in length and kill prey as large as cattle. Most homes cannot accommodate such a large predator. These animals can cause serious infections from bites, causing limb amputations, knock you down with a whip of their tail while it breaks your legs, and even kill you with their bite force of around 2000 pounds. You don't want to see a male gator during mating season. These animals should be respected but not kept as pets. With the exception of the tiny Fennec fox (or the domesticated Silver/Siberian Fox), foxes are not recommended as pets. Red foxes can become very tame, but never fully trustworthy and are especially dangerous around children, just like other wild canines such as wolves. They are far from being domesticated and they also have a musky odor that is far worse than a ferret. They have teeth like any other canine and if scared they may resort to their wild instincts and cause you or someone else harm. Also, most states will destroy a pet fox if a bite is reported because there is no vaccination protocol, despite being similar in size and relation to a dog. 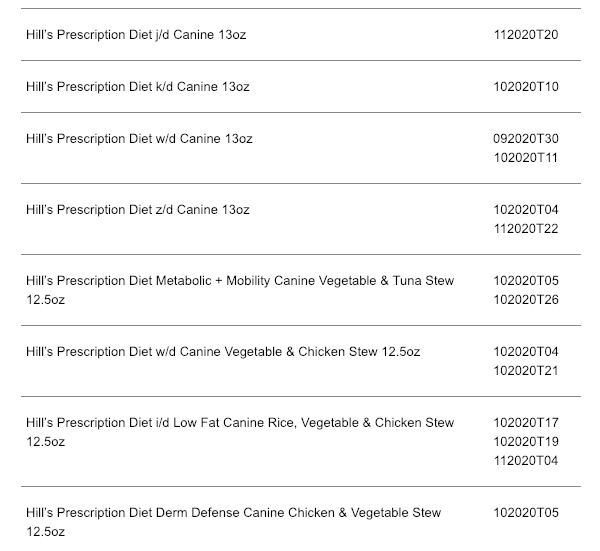 Hill’s Pet Nutrition has issued a voluntary recall of select canned dog food for possible elevated levels of vitamin D.
Consumers should stop feeding the products listed above. Vitamin D is an essential nutrient for dogs, ingestion of elevated levels can lead to potential health issues depending on the level of vitamin D and the length of exposure, and dogs may exhibit symptoms such as vomiting, loss of appetite, increased thirst, increased urination, excessive drooling, and weight loss. Vitamin D, when consumed at very high levels, can lead to serious health issues in dogs including renal dysfunction. Pet parents with dogs who have consumed any of the products listed above and are exhibiting any of these signs should contact their veterinarian. In most cases, complete recovery is expected after discontinuation of feeding. 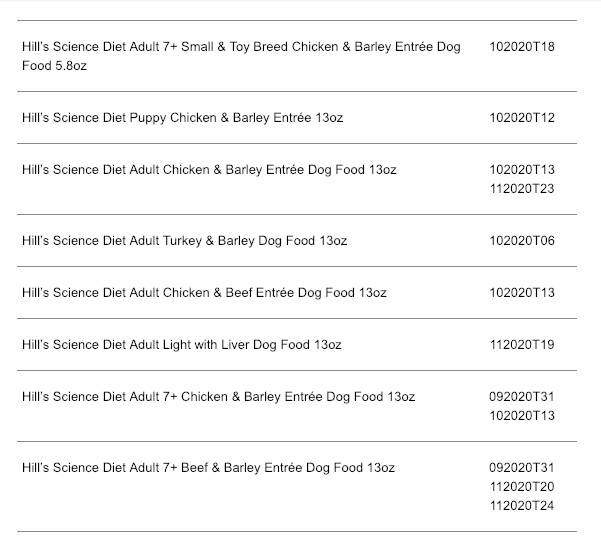 No other items manufactured by Hill’s Pet Nutrition are impacted by this issue. If a patient of ours has purchased food through us, you may can contact us directly, and we can check the product number to see if it's a match. We will handle it case by case. If you have purchased your product through an online vendor, you will need to reach out to that vendor directly or contact Hills at 1-800-445-5777. What is the Canine Distemper Virus? Distemper is one of the most serious diseases your dog can get. It is also one of the most preventable. Here are the facts, symptoms, treatment options, and prevention methods that every dog owner needs to know about distemper. Canine distemper should sound familiar to you if your dog is up-to-date on his vaccinations. Veterinarians consider the distemper vaccine to be a core vaccination, along with the parvovirus and rabies vaccines. The disease is highly contagious and potentially lethal. A paramyxovirus causes distemper in dogs, and it is closely related to the measles and rinderpest viruses. It causes severe illness in the host by attacking multiple body systems, resulting in a widespread infection that is difficult to treat. How Is Canine Distemper Spread? Canine distemper is spread through direct contact or airborne exposure, rather like the common cold in humans. When an infected dog or wild animal coughs, sneezes, or barks, he releases aerosol droplets into the environment, infecting nearby animals and surfaces, like food and water bowls. The good news is that the virus does not last long in the environment and can be destroyed by most disinfectants. The bad news is that distemper-infected dogs can shed the virus for up to several months, putting dogs around them at risk. Dogs are not the only animals that can get distemper. Wild animals like raccoons, foxes, wolves, coyotes, skunks, ferrets, and mink can also get the distemper virus. This means that an outbreak of distemper in the local wildlife population can put dogs at risk for catching the disease even if they do not come into contact with other dogs. Female dogs can also spread the virus through the placenta to their puppies, which is one of the reasons why it is important to fully vaccinate any dog you plan to breed. What Are the Symptoms of Canine Distemper? Distemper dogs experience a wide range of symptoms depending on how advanced the disease is in their bodies. Once a dog becomes infected, the virus initially replicates in the lymphatic tissue of the respiratory tract before moving on to infect the rest of the dog’s lymphatic tissue, the respiratory tract, the GI tract, the urogenital epithelium, the central nervous system, and optic nerves. This results in two stages of symptoms. If a dog infected with distemper survives the acute stage of the illness, he may also develop hyperkeratosis of the paw pads and nose, which gives distemper the nickname “hard pad disease.” This distemper symptom causes the pads of a dog’s feet to harden and enlarge and is uncomfortable. Some dogs develop neurological signs as the disease progresses and attacks the central nervous system. These signs are particularly disturbing for owners. Is my dog at risk for Distemper? Distemper is a risk to all dogs, but unvaccinated dogs and puppies under four months old are particularly susceptible to canine distemper. If your puppy shows any symptoms of distemper, call your vet immediately. There is no cure for canine distemper. Veterinarians diagnose distemper through a combination of clinical signs and diagnostic tests, or through a postmortem necropsy. Once diagnosed, care is purely supportive. Veterinarians treat the diarrhea, vomiting, and neurological symptoms, prevent dehydration, and try to prevent secondary infections. Most vets recommend that dogs be hospitalized and separated from other dogs to prevent the spread of infection. The survival rate and length of infection depend on the strain of the virus and on the strength of the dog’s immune system. Some cases resolve as quickly as 10 days. Other cases may exhibit neurological symptoms for weeks and even months afterward. By following these steps, you can keep your dog safe from distemper. If you have more questions about distemper in dogs, talk to your veterinarian, and call your vet immediately if you suspect your dog might be showing symptoms of distemper.